Every time you apply for a home mortgage, a car purchase and nearly all other types of loans, lenders will use your credit score to determine if you qualify. Creditors need to know how much of a risk you are—in other words, how likely you are to repay the money they loan you. The higher your credit score, the less risk they feel you’ll be. Your credit score is a fluid thing, it constantly changes over time. Keeping your credit in good standing requires an ongoing effort from you. 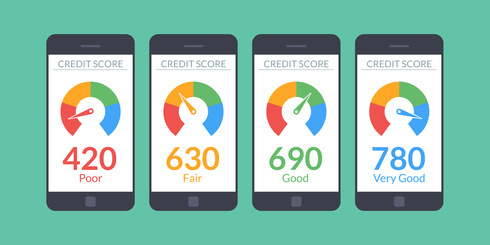 Understanding how credit rating agencies determine your score may help you improve it. You may also like to read this blog post on how to repair credit. This is the most important aspect of your credit report as it accounts for 35% of your overall score. How to make improvements here: always pay at least the minimum payment by the due date. If you miss a payment for more than 30 days, that fact will stay on your credit report for years! This is about how much of available credit you use. For example, if you have two credit cards with a total limit of $5,000 each, you should keep the balance on each of those cards under 50%, in other words, do not spend more than $2,500 on each card. There isn’t much you can do about this part of your credit profile, time is time. However, there’s one thing to note here: once you get approved for a credit card, don’t close the account after a short period of time. It’s better to keep the card and use it on a regular basis. Lenders like to see you use a variety of credit products: loans, car leases, cell phones, major credit cards, department store credit cards, etc. You should have at least two types of active credit lines, for example a $2,000 credit card and a car lease, for at least 2 years. Every time you apply for a credit product and the lender pulls your credit report, it is recorded on your file. If you do this too often, creditors may feel you’re in trouble as you are repeatedly looking for more credit. You should request a credit report once a year to make sure there aren’t any items there that aren’t yours – which may indicate ID theft. Both Canadian credit bureaus provide free reports: TransUnion and Equifax. If you have been turned down for a loan or a mortgage because of poor credit, please give me a call and I can help put together a personal roadmap to credit recovery.